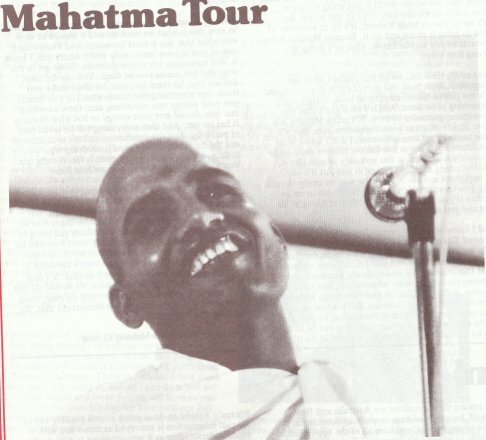 Recently Mahatma Padarthanand Ji completed an extensive propagation tour of Australia. Below are some ??? Mahatma Ji toured South Australia from September 19 till October 2. It was by far his most successful and blissful stay to date. He flew from Melbourne to Mount Gambier, in the south east of the state, staying there nearly two days, where he gave media interviews and a program. He also visited the Tantanoola Caves and the Blue Lake. The visit made quite and impression on the town, and subsequently a DLM centre has started in Mount Gambier on a trial basis. Mahatma Ji flew to Adelaide on the 20th, and gave satsang to a nearly full satsang hall. Next morning twenty five people appeared at the ashram to ask for Knowledge. After a very high Knowledge review on Sunday morning Mahatma Ji drove to Cate and Leigh's farm at Scott Creek. On the Tuesday we drove to Port Pirie where Mahatma Ji did a very successful set of media interviews. This was to publicise our program at nearby Whyalla, to which we flew next day. The Whyalla program was attended by at least twenty true seekers and the local bike club, some of whom listened attentively to satsang. On Monday thirteen brothers and sisters received Knowledge. Due to an air strike Mahatma Ji's departure for Perth was delayed one day. All through his stay dozens of new people came to satsang every night and really experienced something which drew them back again and again. And every day dozens of people would call at the ashram for question-answer sessions with Mahatma Ji. But mere descriptions of what happened can never measure the uplifting effect of Mahatma Ji's visit. Really our favourite saint just completely lifts every practising premie off the ground when he comes. He catalyses innumerable changes for the better, and after only a short while has the most hardened doubters and cynics begging for a little of his time to answer their questions. Mahatma Ji's visit to Perth included a meeting with 20 household devotees, who discussed with Mahatma Ji the importance of the DUO community. Perhaps the most touching event of his tour occurred on a Monday afternoon, when Mahatma Ji attended the funeral service of premie Mark Rawlinson. Mark's family and friends were a little amazed at all the smiling faces, but there wasn't anything to be sad about, after all. Mahatma Ji gave satsang and the musicians sang two songs - Gone Fishing and Country Love. After the service, all the flowers were given to the ashram. The following day, twelve people received Knowledge. The last two evening satsangs were very well attended, and rounded off with group meditation. And after satsang, at the ashram, Mahatma Ji told us a most beautiful story, about how darshan comes when we do service. Mahatma Padarthanand Ji arrived in Darwin on Wednesday October 9. Needless to say, all brothers and sisters were waiting in anticipation. An approximate lapse of five months since Mahatma Ji's previous visit ensured that many were eager to hear the divine message of Truth. A small program was held at Casaurina High School. Mahatma Ji exclaimed that he did not know what to say to children. Divine satsang, however, inspired students to direct questions to premies for a lengthy time after the program had finished. The second evening saw a public program held in the local Country Women's Association Hall. As usual, the hall was full. The film Satguru Has Come was shown followed by Mahatma Ji's satsang, and then the ever-welcome tea and home-made biscuits. Brothers and sisters went to Lindsay Street after the program and Mahatma Ji spent a couple of hours answering "beautiful questions", as he called them. The final program was held in Brown's Mart, a local theatre. It provided a good stage plus all necessary lighting needed for the production of The Three Fat Fairies, a play written and performed by premies. The play was preceded by a few songs plus introductory satsang. Mahatma Ji graced us with a lengthier satsang than usual which brought many brothers and sisters to the ashram crying for Knowledge. By His amazing Grace, a Knowledge session was held the following morning. Nine brothers and sisters received His divine gift. "Before I took Knowledge I was terrified, I did not know what to expect. But I think this Knowledge will give me a lot of peace as I am growing. How can I thank Guru Maharaj Ji ……. Jai Satchitanand!" It was evening and Mahatma Ji was coming to Cairns. Five months had passed since his last visit, and 30 shining-eyed people were gathered in the arrival lounge at Cairns airport. A light appeared in the northern sky. "Oooh", we went, and "Aaah". The light became an aeroplane and rolled to a stop a hundred metres from the gate. In the hot darkness the passengers were invisible until within range of the ??? mosquito light. Glances were exchanged, flowers clutched more tightly. A liquid energy filled the room. One by one the passengers pushed through the door. A farmer, wide hat and riding boots. Another farmer. A young mother with sleepy kids, smile ready, eyes darting through the crowd to catch her husband. Then no-one. The lounge turned silent and we continued to search the skies. The reception clerk was closing his office. Mahatma Ji had missed his connection from Darwin to Mount Isa. Back to the ashram and hastily phoning the airline company there. Closed. Try the airport. Eventually someone answers. The cleaner. "Oh yes, about 5'8", dark skin, long pink robes and bald?" Mahatma Ji had been positively identified. But where had he been sent for the night? Every hotel and motel in the book was phoned fruitlessly. At 10 pm we contacted Wentworth Avenue to ask for help. "David", we said, "We have lost our Mahatma". Nothing to do until morning. And at 9 am we found him at the Welcome Inn, Mount Isa. "Mahatma Ji, we have been worried about you. Where have you been?" "I am very well! My plane was late." "Are you being looked after? Have you good food to eat?" "I am all right! I am living very naturally. How is Cairns?" "It's very nice Mahatma Ji. Everyone sends their love. I will be in Cairns at 4 o'clock tomorrow. Jai Satchitanand to all of you." And he was. Our best premie car was recleaned and decorated, and our saint was with us again. That night 57 people were crammed chin to knee into the satsang room. A record. Mahatma Ji gave powerful and loving satsang, impartially reaching both hearts and intellects. The next day he spent talking with premies and visiting them in their homes, and answering questions from those who were interested in receiving Knowledge. Simple words and gestures were practical examples of his humility and tact, and many of us were finding our minds were being very subtly but completely "blown". On Tuesday there was a Knowledge session. Eight brothers and sisters who had been attending satsang and serving for quite a while received Knowledge and experienced some very beautiful things. That evening Mahatma Ji asked to be driven to the fair which was taking place down the street as part of the annual Cairns "Fun in the Sun" festival. The following day he left us and continued on his way. We all know that in order to see clearly and far we must make ourselves high. But consciousness is such a relative thing. A candle may appear quite bright and efficient until someone taps an electric source, and in the same way we may become satisfied with the limits of our own vision until a true seer arrives and extends our field. Mahatma Ji, it's very nice to know you!